Water injection to maintain reservoir pressure and so boost production remained a core challenge a meeting of National Oil Corporation (NOC) technocrats was told today. 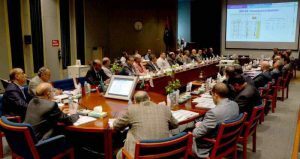 Senior technical and engineering staff from NOC’s Tripoli head office met their opposite numbers in the state oil company’s wholly-owned subsidiary the Arabian Gulf Oil Company (AGOCO) at that firm’s headquarters in Benghazi. Until now, the meeting was told, water injection projects have been delayed by lack of funds. Of similar importance was the repair and maintenance of wells along with drilling, reservoir and laboratory studies. NOC said that AGOCO’s 2018 drilling and makeover programme was examined and budgets proposed to cover this work. It was agreed that priority be given to wells that could be brought on stream as soon as possible. NOC said the technocrats also looked at a ten-year field development plan but it gave no details of which fields this was likely to involve. At a separate workshop, IT specialists examined upgrades to field data collection and the aggregation of this information along with its access across AGOCO and NOC .